America loves barbecued ribs, and I do as well, but Italians cook them in tomato sauce. The meat and sauce are absolutely succulent, and everybody at our home enjoys picking the meat off the bone. This wonderful entrée is featured in the Homegrown Heroes episode of Lidia Celebrates America. Bring the red wine to a boil in a medium saucepan. Lower the heat so the wine is boiling gently and cook until the wine is reduced to 1 cup. Set aside. Pour 1 cup of the hot stock over the mushrooms in a small, heatproof bowl. Let stand until softened, about 20 minutes. Drain the mushrooms in a sieve lined with a double thickness cheesecloth or coffee filter; reserve the soaking liquid. Rinse the mushrooms briefly to remove any grit. Chop the mushrooms coarsely and set them aside. Season the ribs generously with salt and pepper. Heat the oil in a wide, heavy braising pan over medium heat. Lay as many of the short rib pieces as will fit into the pan in a single layer. Cook, turning as necessary, until evenly and well browned on all sides. Remove them to a plate and repeat with the remaining ribs. Adjust the heat as the ribs cook, so that they brown without burning. Pour off all but about 2 tablespoons of the fat from the pan. Stir in the onions and bacon and cook, stirring, until the onions are lightly browned, about 6 minutes. Stir in the chopped mushrooms and the carrot, rosemary, bay leaves, and cloves. Season lightly with salt and pepper, and cook until the carrot is wilted, about 3 minutes. Drop in the tomato paste and stir well until the vegetables are coated and the tomato paste begins to darken, 2 to 3 minutes. 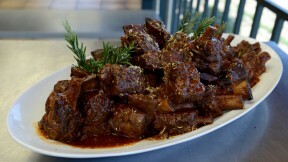 Pour in the reduced wine and the crushed tomatoes and tuck the browned short ribs into the pan. Pour enough of the remaining chicken stock to barely cover the ribs. Bring to a boil, then lower the heat so the liquid is at a lively simmer. Cook, adding the remaining stock a little at a time as necessary to keep the ribs covered, until the ribs are tender and just about to fall off the bone, 2 1/2 to 3 hours. Taste the cooking liquid from time to time as the ribs cook and add salt as necessary. Pick out the ribs from the sauce, carefully so as to prevent the bone from falling out, and set them on a baking sheet. Ladle the cooking liquid into a sieve placed over a bowl and push the liquid through with the back of the ladle. Discard the solids in the sieve and return the strained liquid to the pan. Tuck the ribs back into the sauce. You may serve the ribs at this point, or cool them in the liquid and refrigerate them for up to three days. Bring them back to a simmer and cook until heated through before serving.